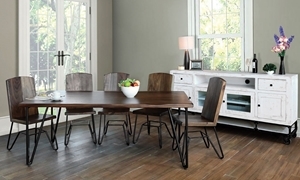 Industrial dining table designed with 79 inches of solid exotic parota and iron legs. 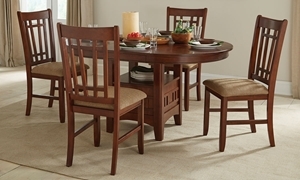 Casual craftsman-style dining set includes round pedestal storage table and four lattice back side chairs in a cherry finish. 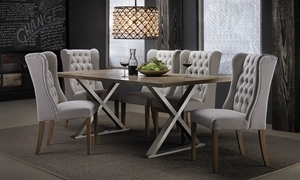 Farmhouse-style 104-inch weathered trestle table and four city-chic side chairs in tufted neutral upholstery with nail head trim. 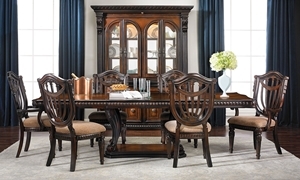 Sophisticated dining set includes a 108-inch shaped pedestal table with walnut inlays and four lute-back side chairs in a cinnamon finish. Rustic 87-inch dining table with elegant trestle base handmade from solid planks of reclaimed elm and pine. 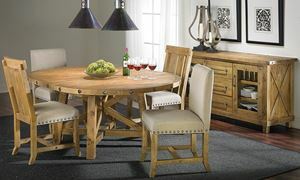 Round dining set features hand-sawn pine construction with subtle aging and a pale washed finish. 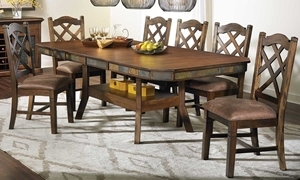 Dining set made from sustainable mango hardwood in a warm copper finish. 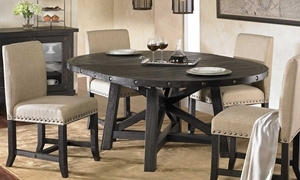 Rustic casual dining set includes a 90-inch table with natural slate apron and storage pedestal base, plus four lattice back side chairs. 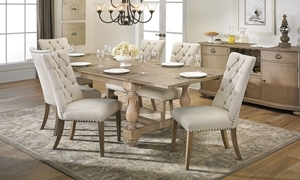 Dining set features round extension table and four upholstered chairs in hand-hewn pine with a weathered finish. Dining table handcrafted from reclaimed elm and stainless steel.